All we’ve done here is shift the bottom row to the top row in the 3rd and 4th rotations, such that the non-corner square of the T-piece now always occupies the same point in the 4×4 grid and is thus the center of rotation in all cases. T-spins will now in general work without any actual changes to the game code or logic, however there is a problem when the T-piece is touching the bottom of the bucket which must be addressed. It is in step 4 where the problem occurs: if a T-piece has been rotated such that its flat side is vertical and its left or right corner is touching the bottom of the bucket, and is then rotated once such that its flat side is now facing the bottom, the re-alignment code will push the T-piece down one row: it was touching the bottom of the bucket before rotation, so the re-alignment code makes the flat side of the T-piece touch the bottom of the bucket after rotation. This changes the center of rotation for the T-piece for this one particular rotation scenario, and will ultimately prevent the rotation altogether as it will cause a collision with other, already-placed tetriminos. As a result, T-spin when the T-piece is touching the bottom row becomes impossible. Instead of immediately abandoning the rotation attempt if there is a collision with an existing piece in the bucket, we instead first check if the colliding piece is aligned with the bottom of the bucket. If not, the rotation fails and the piece reset to its previous position and rotation as before. However, if it is aligned with the bottom, we give it another chance: first we move it up one row, then check for collisions again. For T-pieces, this effectively (in a clunky way) reverses the alignment correction when the flat side is touching the bottom, and restores the center of rotation to its original point. T-spin locks will now work as expected. Note that – in contrast to the T-spin documentation on Wikia – we are not electing to specifically recognize when a T-spin has cleared a line, or two lines (a so-called “T-spin double”), or give any kind of points bonus for this, although it is fairly simple to add. Similarly, we currently allow the same “impossible” rotations with any piece; you can for example pull off a tricky “L-spin” too. If you want to award points for a T-spin, T-spin double and/or prevent impossible rotations for non-T-pieces, the solution is the same in all cases: add a boolean flag to each shape, true if it is the T-piece, false otherwise, only allow the additional bucket logic code to execute if the flag is true, and when a line is cleared, if the flag of the last fallen piece is true (the line was cleared by a T-piece), check the piece’s mobility to the left, right and up: if none are possible, it’s a T-spin lock and you can award bonus points (another way to check for a T-spin lock is to see if at least 3 of the 4 corners diagonal to the center of the T-piece are occupied when the piece comes to rest). 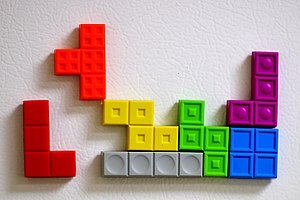 See Wikipedia’s Tetromino page for more information about Tetris shapes and terminology. See Wikia’s Tetris T-spin page for more information about T-spins. See Wikia’s Tetris Guideline page for the current (revised 2006) guideline rules for making Tetris clones behave in a manner compliant with The Tetris Company’s internal guidelines (note that SimpleTetris is not fully compliant at this time). See Squidoo: How To Become A Professional At Tetris for Tetris strategy. Thanks to Anders Heimsvik for pointing out that T-spins weren’t working in SimpleTetris. Eh, nevermind. Reading the specifications closer, some games simply conclude t-spin by immobility like you suggested.